To send me an E-Mail, Click on an Android above. 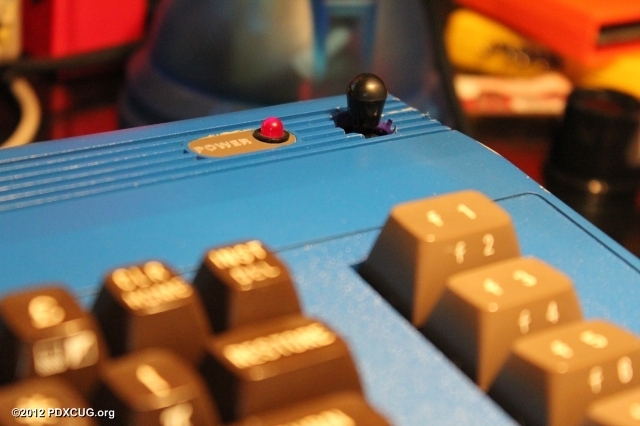 At the last ECCC show, I was talking to goog of PDXCUG about an idea of putting hinges on the back of a C64 so the top could be "flipped open" with out dealing with the screws all the time. I also talked to AgentFriday (the guy behind the 38.4k driver for the Comet64 internet modem.) about an external solderless breadboard hooked to the Kernel ROM socket inside the 64 using a ribbon cable with 28 pin IDC connectors on the end. I wanted to do the same thing BUT have the breadboard mounted on TOP of the 64 so what you see below is my latest project. The 64 looked like garbage already so I didn't mind drilling/cutting/melting it or what ever. I'm looking for one of these DIGITAL Joysticks, JAMECO had them a few years back. They no longer have them. Just received a box of 7 - C64s, none working BUT I knew that when I got them, One board is a Rev A, I don't have any of those so I'm going to try to get it working. First thing I did was to do the "HEAT CHECK". I put power to it and left it on for about 15 minutes and started looking for HOT chips, I found 2 RAM chips that got real hot, U9 and U23, I pulled them, put in sockets and put in tested/working RAM chips. Board still not working. All of he socketed ICs, I pulled them and tested them in my testbench system, (One 6522, CPU, PLA, VIC) all tested good. I have seen a BAD SID cause problems so I pulled that, No luck but the SID was good. I just got done pulling the other six memory chips , three of the six were bad, I'm installing sockets on any IC that I pull, might as well. Earlier I pulled the Basic and Character ROMS, both tested good but realized I didn't have any 24 pin IC sockets until I starting digging into another box of parts boards that was also given to me. SUCCESS an Assy# 250425 board had sockets. I put the sockets and original ROMS back onto the Rev A board. I didn't put the SID back in at this point, Took the board over on the testbench, hooked it all up (Power/Vid) and turned it on. SUCCESS!! It's ALIVE!!!! It was the RAM that caused the problems. I nstalled a socket and put the 83' dated SID back in it and used my Easyflash3 cartridge with Prince Of Persia on it. Loaded up and playes just fine. Another dead board brought back to life. When I first turned the board on, Video flickered, got a little click from the audio, drives initialized but NO Blue startup screen. So from now on AFTER I check the PSU/PLA I'll look at the RAM as the problem. A guy on Lemon64 has a bad Newtronics drive mech. I had one in my parts box that was given to me so I pulled apart the nearest 1541 that I had to hook the drive to. I tried to load a disk of "Pool of Radiance" and "Wasteland" Neither would load in the drive mech BUT would load fine in another drive. I have never aligned a disk drive so I figure why the heck not give it a try. I have a copy of the "Free Spirit 1541/1571 drive alignment disk and software". I put the disk in and loaded the 1541 program from the disk, it loaded fine. After doing some tests the software said the drive needed an alignment. I read the info on doing this and started working at it. The screen says it's "Satisfactory/Needs alignment" it flashes between the two while telling what track it's on. You can see it in the picture below, well the Satisfactory anyways... I played around for almost 2 hours. This is one task that is trying my patience for sure. :) At the time of this entry, I was STILL trying to get the drive aligned... I'll update this entry IF I get this drive working. Figured it was time for an entry, it's been awhile. I've been lazy heh. I received my Easyflash 3 from Jim Brain a couple days ago. Glad to finally have one of these in hand. Its a really nice piece of hardware to own. You can program 8 Kernels and 7 Easyflash images into ONE cartridge. It also has slots for the Action/Retro replay images, 1 slot for the Supersnapshot. I use the uIEC w/1GB SD Card to copy the images to the Easyflash 3 since they are to large for floppy disks. IF you do this, the uIEC must have the 0.10.2 and above firmware or it will just hand when you try to access the uIEC and the Easyflash images. I got to playing with a disk image of "Demon Stalkers". Manual A friend was looking for a working copy of the game. The archive has .nbz and .g64 files in it. I have a parallel port modded 1571 and a 1541-][, I used the command "nibwrite -D8: " to write either the .g64 set or the .nbz set. Neither drive has any extra RAM in them, Both Box stock except the parallel port mod. If we tried to use an unmodded drive, writting the images would fail. Is this an error OR is the Parallel port mod REQUIRED to write the .nbz and .g64 files. EDIT: It has been brought to my attention to use the "-s" option to use nibwrite on a NON-Parallel port 1571 to write .nbz and .g64 files to disk. Thanks to OfficialNinja for that info. Just in case you DON'T KNOW about the Wasteland 2 Kickstarter, you do now. If you liked the game on the C=/PC then Pledge what you can. It has less than 40 hours left. I'm at the $250 pledge level myself. A couple days agon a friend of mine, mhoney on IRC sent me a Samsung Syncmaster 150MP LCD Monitor & TV to use on my C= system. It has an svideo input port on it so I purchased an Svideo cable from a guy in the UK on ebay. Here is a picture of the Monitor with the C64 booted up. As soon as the remote for the TV arrives, I'll play with the video a bit more, I want to make some adjustments as you can see from the picture that need to be completed. A couple days ago I ordered an "RGBiNterface" from MyTec Electronics. Same place that makes the ThunderDrive. They are currently only produced as they are ordered. If you would like info/order one send email to "workspace AT wowway.com" The other board is a (eBay Link) video converter used to connect Arcade JAMMA game boards to VGA monitors. I used the Model 8220 type board as seen in the 3rd picture. I ordered a ThunderDrive and a Flyer today. I was working some overtime so I figured I might as well pick up these 2 nice new pieces of C= hardware. From what I hear and read, they both are great pieces of hard to own. The Thunderdrive is a replacement for the CMD hard drive. If you can't get a CMD HD then get a Thunderdrive, you won't regret it. Update : The Flyer Arrived on Friday that 27th and the Thunderdrive arrived on Saturday the 28th. I have not fired up the Flyer yet as software is still being worked on for more features. The Thunderdrive on the other hand has been hooked up, fired up and had Wheels 128 v4.4 installed on it. Boots from device #8 and loads Wheels up perfect. I received my 1MB REU PCBs from Vanessa the other day, these are a clone of the CMD 1750XL REU Cart. I ran them thru a bunch of tests, 100% Working for everything I did. I tested the carts on a 128DCR, C64, 64C and an SX64. All REU Tests passed on all of the machines. I also ran GEOS and WHEELS 128 v2.0 on them, PERFECT! Vanessa great job. Now I can put away my power hungry C= 1750 REUs. Vanessa is currently OUT of stock on these. She is working on another update to replace the MOS REC Chip (The large Square PLCC ship on the PCB) into something else, the REC chips are in short supply if they can even be found at all. A received a couple more pictures of Jason Ranheim cartridge board from Joe, He says "Attached is the Jason Ranheim RTC cartridge pics, which I can't find any info on other than the model# CCSZ." Does anyone know anything about these boards? Would be interested in hearing from you on them. I'll edit this entry with any information I get. Click on the Androids at the top of the page to send me an Email with any questions. Ok, I figured it was time to finally roll into 2012 and update the blog. I really haven't been doing much, been a bit lazy lately. I know, SHAME on me. I picked up a Cardboard Expansion Interface off of ebay a few days back. Been wanting one of these for awhile. I dropped $40 for it, the thing is like brand new. It's nice and clean, no discolorations dings scratches or anything. I even got the original manual not that there is all that much to the adapter really. A reader of the blog sent me an email letting me know that he had one of the Jason Ranheim PCC-8 cartridge boards. I have never SEEN one so I asked him to send me some pictures of the board. What he sent was a set of perfect pictures of the board. I take NO credit for these pictures except for posting them to share. Joe, Thanks a TON for the great pictures. Here is a scan of the instructions for the PCC-8 board. JR-PCC8docs.pdf Thanks to Moloch on IRC for this file.